The world of high-tech innovation can change the destiny of industries seemingly overnight. Now we are on the cusp of a new grand leap thanks to the democratization of machine learning, a form of artificial intelligence that enables computers to learn without being explicitly programmed. This process of democratization is already underway, according to this opinion piece by Kartik Hosanagar (@khosanagar), Wharton professor of operations, information and decisions, and a cofounder of Yodle Inc., and, Apoorv Saxena (@apoorvsaxena1), a product manager at Google and co-chair of the recent AI Frontiers conference. Last month, at the CloudNext conference in San Francisco, Google announced its acquisition of Kaggle, an online community for data scientists and machine-learning competitions. Although the move may seem far removed from Google’s core businesses, it speaks to the skyrocketing industry interest in machine learning (ML). Kaggle not only gives Google access to a talented community of data scientists, but also one of the largest repositories of datasets that will help train the next generation of machine-learning algorithms. As ML algorithms solve bigger and more complex problems, such as language translation and image understanding, training them can require massive amounts of pre-labeled data. To increase access to such data, Google had previously released a labeled dataset created from more than 7 million YouTube videos as part of their YouTube-8M challenge on Kaggle. The acquisition of Kaggle is an interesting next step. Market-based access to data and algorithms will lower entry barriers and lead to an explosion in new applications of AI. As recently as 2015, only large companies like Google, Amazon and Apple had access to the massive data and computing resources needed to train and launch sophisticated AI algorithms. Small startups and individuals simply didn’t have access and were effectively blocked out of the market. That changes now. The democratization of ML gives individuals and startups a chance to get their ideas off the ground and prove their concepts before raising the funds needed to scale. But access to data is only one way in which ML is being democratized. There is an effort underway to standardize and improve access across all layers of the machine learning stack, including specialized chipsets, scalable computing platforms, software frameworks, tools and ML algorithms. Complex machine-learning algorithms require an incredible amount of computing power, both to train models and implement them in real time. Rather than using general-purpose processors that can handle all kinds of tasks, the focus has shifted towards building specialized hardware that is custom built for ML tasks. With Google’s Tensor Processing Unit (TPU) and NVIDIA’s DGX-1, we now have powerful hardware built specifically for machine learning. Even if specialized processors were available, not every company has the capital and skills needed to manage a large-scale computing platform needed to run advanced machine learning on a routine basis. This is where public cloud services such as Amazon Web Services (AWS), Google Cloud Platform, Microsoft Azure and others come in. These services offer developers a scalable infrastructure optimized for ML on rent and at a fraction of the cost of setting up on their own. A major issue in the wide-scale adoption of machine learning is that there are many different software frameworks out there. Big companies are open sourcing their core ML frameworks and trying to push for some standardization. Just as the cost of developing mobile apps fell dramatically as iOS and Android emerged as the two dominant ecosystems, so too will machine learning become more accessible as tools and platforms standardize around a few frameworks. Some of the notable open source frameworks include Google’s TensorFlow, Amazon’s MXNet and Facebook’s Torch. The final step to democratization of machine learning will be the development of simple drag-and-drop frameworks accessible to those without doctorate degrees or deep data science training. Microsoft Azure ML Studio offers access to many sophisticated ML models through a simple graphical UI. Amazon and Google have rolled out similar software on their cloud platforms as well. Not only do we have an on-demand infrastructure needed to build and run ML algorithms, we even have marketplaces for the algorithms themselves. Need an algorithm for face recognition in images or to add color to black and white photographs? Marketplaces like Algorithmia let you download the algorithm of choice. Further, websites like Kaggle provide the massive datasets one needs to further train these algorithms. All of these changes mean that the world of machine learning is no longer restricted to university labs and corporate research centers that have access to massive training data and computing infrastructure. Back in the mid- and late-1990s, web development was done by specialists and was accessible only to firms with ample resources. Now, with simple tools like WordPress, Medium and Shopify, any lay person can have a presence on the web. The democratization of machine learning will have a similar impact of lowering entry barriers for individuals and startups. Further, the emerging ecosystem, consisting of marketplaces for data, algorithms and computing infrastructure, will also make it easier for developers to pick up ML skills. The net result will be lower costs to train and hire talent. We think that the above two factors will be particularly powerful in vertical (industry-specific) use cases such as weather forecasting, healthcare/disease diagnostics, drug discovery and financial risk assessment that have been traditionally cost prohibitive. Just like cloud computing ushered in the current explosion in startups, the ongoing build-out of machine learning platforms will likely power the next generation of consumer and business tools. The PC platform gave us access to productivity applications like Word and Excel and eventually to web applications like search and social networking. The mobile platform gave us messaging applications and location-based services. The ongoing democratization of ML will likely give us an amazing array of intelligent software and devices powering our world. VIENNA – Last week’s chemical attack on the rebel-held Syrian city of Khan Sheikhoun compelled US President Donald Trump to strike for the first time at Syrian President Bashar al-Assad’s forces. With the bombing of an air base in western Syria, the Trump administration stepped into a gaping power vacuum in the Middle East. But what, if anything, will Trump do next? Coming after six years of civil war, in which some 400,000 civilians have been killed and millions displaced, Trump’s unexpected intervention was praised by most US politicians, though it was carried out without the requisite congressional approval. Syrian rebel groups and America’s international allies (including those at the just-concluded meeting of G7 foreign ministers in Italy) welcomed the United States’ attack on Syrian government forces. With 59 Tomahawk missiles, Trump sent a message to the Assad regime and its patrons, especially Russia and Iran, that he, unlike his predecessor Barack Obama, is willing to enforce “red lines.” Unsurprisingly, Vladimir Putin’s Kremlin condemned the US attack, claiming that it violated international law – a questionable proposition, given that Syria is a signatory to the international treaty banning chemical weapons. But whatever statement Trump’s decision made, it seems destined to be drowned out by his administration’s subsequent babble of strategic incoherence. While Nikki Haley, the US ambassador to the United Nations, has suggested that Assad’s ouster is now a priority, Secretary of State Rex Tillerson insists that defeating the Islamic State (ISIS) still tops America’s agenda. Worse, Trump’s decision to take military action was reportedly influenced by his daughter, Ivanka, who claimed to be “heartbroken and outraged” by the images of the victims of the chemical attacks. Impulsive actions driven by personal feelings are no substitute for a long-term foreign policy. In fact, it is the lack of a clear and comprehensive approach that allowed Russia to embed itself in the Syrian conflict in the first place. From Putin’s perspective, Obama’s reluctance to engage created a golden opportunity to get his foot in the Middle Eastern door. Putin’s goal in the region is not to have long-term or positive influence. Rather, he wants to wedge Russia between various actors that lack coherent policies toward one another, thereby boosting Russia’s own power and prestige. Like any good KGB operative, Putin is playing all sides, in order to advance his own agenda. And, already, a new kind of Warsaw Pact is taking shape. As part of this strategic game, Russia has worked to increase its influence over America’s closest ally, Israel. In the last year alone, Putin and Israeli Prime Minister Binyamin Netanyahu have held five meetings and deepened bilateral ties. Squeezed by sanctions imposed over Russia’s annexation of Crimea, Putin is looking to Israel’s technology sector to provide what the West no longer will. Israel, for its part, hopes that Russia will help rein in Iran. Contrary to some of Netanyahu’s public statements, Israel does not oppose Russia’s intervention in Syria; it believes that Assad is a lesser evil than a chaotic failed state, such as Libya after the removal of Colonel Gaddafi in 2011. Putin is also making inroads in Iraq. Last year, the Kremlin sent the largest delegation in years – over 100 officials – to Baghdad to strengthen commercial and security ties. The resulting exchanges have focused largely on military assistance, though Putin has also wooed Iraq’s new ambassador to Russia, Haidar Mansour Hadi, with the prospect of cooperation in the energy sector. Then there is Afghanistan, where Russia has sought to forge a viable relationship with the Taliban, replicating the US behavior of the 1980s. By courting the Taliban, Putin is helping to destabilize the already weak government in Kabul – and making himself indispensable to any US strategy to escape the longest war in its history. In Egypt, Russia is also attempting to recapture its Soviet-era influence. And it has had some success with Egyptian President Abdel Fattah el-Sisi, an eager devotee of Putin’s model of strongman governance who also has a strong interest in rebuilding Egypt’s tourism industry – an effort to which Russia can contribute. Before terrorists blew up a plane carrying Russian tourists as it flew over Sinai in 2015, Russians accounted for 30% of visitors to Egypt. While Russia recently restored commercial flight service to the country, the suicide bombings at two Coptic churches on Palm Sunday have called into question Sisi’s promise of security. Egypt’s travails provide Putin with further opportunities to lend a hand. Already, Russia has received permission to expand its special industrial zone in Port Said, and the government has signed billion-dollar contracts for Russian military equipment, including missile systems. Moreover, Egypt has given Russia access to air bases to deploy special forces in Libya in support of Khalifa Haftar, the warlord whom Putin is backing. Putin’s foreign policy is based not on wielding Russian strength, but on capitalizing on others’ weaknesses. Winning the loyalty of failing regimes by pledging to prop them up may seem to be a successful strategy, but the house Putin is building is made of cards. Russia has neither the wealth nor the military power to sustain failing regimes ad infinitum. Putin must know that. Tillerson certainly does. During his visit to Moscow this week, Tillerson appeared to make it clear that, if Putin continues to be part of the problem in the Middle East, Russia’s relationship with the US will deteriorate further. Because Putin respects strength, and wants to be treated by the US on equal terms, he could well be convinced to become part of the solution. With the bilateral relationship at such a low point, it is somewhat promising that both sides agreed during Tillerson’s visit to establish working groups for improving it. But persuading Putin to get on the “right” side in Syria in the long term will require the Trump administration to present a real solution – which, so far, it has not shown itself to have. The White House has few wins, no strategy, and one big problem that can't be fixed: the president himself. I’ll cede right upfront that 100 days is a wholly arbitrary standard by which to judge an administration’s success. But it is as lasting a Franklin Roosevelt legacy as Social Security, and the Trump administration validated it as a measuring stick for grading its performance, so here’s my preliminary assessment. The appointment of Neil Gorsuch to the Supreme Court was a major achievement, even at the significant price paid of ending the 60-vote threshold for confirmation of Supreme Court justices. Not only is Gorsuch an eminently qualified selection, but his appointment served the crucial purpose of affirming to conservatives that however erratic President Donald Trump may otherwise be, he made good on his promise of a solid high-court selection. That will buy the president an awful lot of sail to make mistakes in other domains before conservatives desert him. And he will need it, because the rest of his agenda has run aground. Despite what is ostensibly his political party in command of both houses of Congress, the president suffered a huge defeat by failing to pass legislation repealing and replacing Obamacare. Whatever the relative merits of the legislation, Trump could not garner the support of his party. The president’s cursory attempts seemed to falter on his lack of substantive understanding of the issue and the legislation, his failure to comprehend that ostensible allies had alternatives to supporting him, and his issuance of hollow threats easily dismissed by his adversaries. Trump’s executive order on immigration and refugees was an even higher-profile failure. Unlike the executive order on the National Security Council, whose deficiencies seem to be more of sloppiness in drafting rather than malevolence, the immigration EO seemed purposeful — it intended to do what it said it would do, and the president repeatedly reinforced that impression. Not only did the attempt damage America’s standing in the world and fray the country’s multicultural cohesion, but Trump energized the courts, civil society groups, and a wide swathe of Americans to oppose his policy. Crazily enough, the Trump administration’s illiberal tendencies may prove a boon for American democracy by revitalizing the checks and balances that constrain executive action and stimulating civics education. In the national security realm, Trump has needlessly alienated America’s friends and showed himself decidedly unserious about addressing the paramount vulnerability of our country, which is our rapidly accruing national debt. His budget request would wildly expand deficit spending, relying on draconian cuts to small-ticket discretionary items (like the State Department budget) without addressing the entitlements elephant that will very quickly crowd out all other government spending — even before the interest rate hikes the Federal Reserve has initiated kick in to bond market prices. To the president’s credit, he did make clear his priorities; budgets are, after all, documents that reveal governing priorities. But Trump doesn’t appear to have legislative support to pass such a budget. Firing a salvo can be a useful tactic, even if it doesn’t achieve all you wanted. But coming on the heels of other legislative failures, the budget is more likely to highlight the president’s ineffectualness at governing. The selection of reasonable men for the cabinet’s national security portfolios, and fortuitous immolation of the deeply compromised national security advisor Mike Flynn, has attenuated concern about the Trump administration’s handling of foreign policy. But the paucity of appointments to fill out the ranks in State and the Department of Defense is beginning to look like design to leave them hobbled. Meanwhile, the unfolding of Syria policy seems likely to parallel in its deficiencies the characteristics of the president’s domestic policies. A reasonable but unarticulated policy driven by the DOD has emerged: Increase the pace of military operations to defeat the Islamic State, leave President Bashar al-Assad in place to prevent a post-Islamic State power vacuum, prioritize cooperation against the Islamic State in relations with Middle East countries over concerns about domestic governance or their conduct of military operations, and respect Russian interests. In the space of 24 hours by Trump’s reaction to the 25th or so use of chemical weapons by the Assad government, he changed course, electing to punitively strike a jointly manned Syrian-Russia air base from which the chemical attack had been launched. The administration has been a cacophony of divergent voices since. Trump’s statement was expansive — Wilsonian — in its internationalism. The U.N. ambassador whipped up regime change in her statements. The secretary of defense remains mostly silent but issued a statement narrowly interpreting the change in policy to encompass only penalizing and deterring chemical weapons use. The national security advisor championed that expansion as a big change in policy. The secretary of state has labored to keep Syria policy narrowly focused but seems to believe the strike will radically change Russia’s calculus, causing it to forgo the large investment it has made in Assad’s survival. On the eve of his trip to Russia, Secretary of State Rex Tillerson goaded G-7 allies to challenge Russia’s fundamental foreign-policy direction. The White House spokesman seemed to expand the mandate to preventing Assad from using barrel bombs without chemical weapons. The administration’s problem is deeper than talking at cross-purposes. Strategy requires discipline, and indiscipline is the fundamental characteristic of this president. He indulges himself to be unpredictable, but predictability actually matters in national security. It helps prevent miscalculation in complex circumstances. It clarifies who your friends and adversaries are, allowing you to array the former against the latter. It allows allies to synchronize their policies to reinforce ours, and rewards them for doing so. It prioritizes action. It is essential to cost-efficiency. The pattern emerging in Trump’s first 100 days is of a scattershot administration with scant ability to organize and lead domestic or international activity. Maybe none of this will matter to the president’s supporters — perhaps his value statements like the budget priorities, the wall, and the immigration ban are sufficient. But if the characteristics on display in the health care thrust and Syria are indicative of Trump’s governing skills, not even the deliberative men of his cabinet can compensate for these deficiencies. They can give better shape to the president’s policies, but they cannot prevent him from making erratic choices and adopting contradictory policies, which Trump seems inclined to champion as a virtue. Much as the public and the administration might wish otherwise, in the American system of government, there’s no way to marginalize the influence of the president. Why gold has not responded to geopolitical risk or reflation talk. AMERICA has bombed Syria, and its relations with Russia have deteriorated. North Korea is developing a long-range nuclear missile, a development which Donald Trump has vowed to stop, unilaterally if necessary. There is talk of a “reflation trade”, with tax cuts in America pepping up global growth. 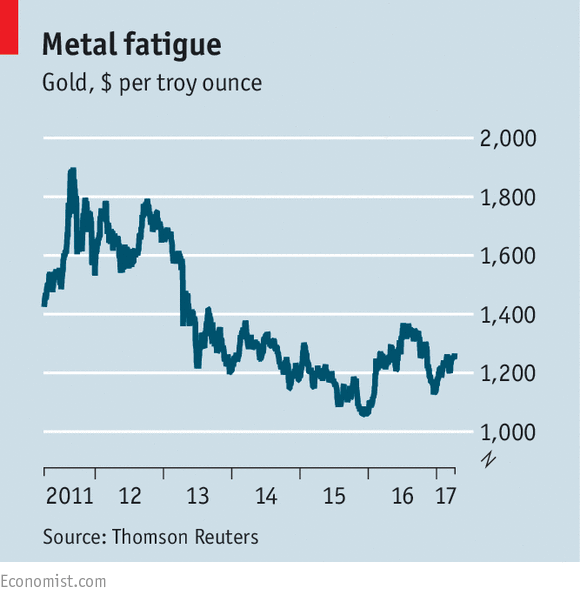 All this ought to be good news for gold, the precious metal that usually gains at times of political uncertainty or rising inflation expectations. But as the chart shows, gold took a hit when Mr Trump was elected in November and is still well below its level of last July. As a watchdog, gold has failed to bark. Bullion enjoyed a ten-year bull market from 2001 to 2011, when it peaked at $1,898 an ounce. This long upward run was bolstered in its later stages by two developments: first, the use of quantitative easing (QE) by central banks, which gold bugs argued would inevitably lead to high inflation; and second by the euro crisis, which caused nervousness about the potential for a break-up of the single currency and about the safety of European banks. By 2013, however, euro-zone worries were fading and, despite QE, no inflation had been seen. The gold price fell sharply and has stayed in a narrow range since. Last year was a disappointing one for jewellery demand, with an annual survey by Thomson Reuters finding that jewellery fabrication fell by 38% in India (where it was hit by a new excise duty) and by 17% in China. The Chinese central bank was also a less enthusiastic gold-purchaser than before: net central-bank buying dropped to a seven-year low. The big change in the gold market since the turn of the millennium has been the rise of exchange-traded funds (ETFs), which have made it easy for investors to get exposure to the metal without worrying about storing it or insuring it. At the peak, gold ETFs held around 2,500 tonnes of gold, according to Citigroup, worth around $100bn at today’s prices. Gold ETFs were bought as a classic “momentum trade” by investors who try to make money by following trends. Once the price trend changed in 2013, such investors scrambled to get out of the metal. At the moment ETFs hold just 1,800 tonnes. The problem with gold is that there is no obvious valuation measure. The metal pays no real “earnings”. Although gold is seen as a hedge against inflation, it cannot be relied on to fulfil this function over the medium term; between 1980 and 2001, its price fell by more than 80% in real terms. The general rule is that gold is seen as an alternative currency to the dollar, so when the greenback does well, bullion does badly. But this also means that gold’s performance can look rather better in other, weaker currencies. Since the Brexit referendum, for example, bullion is up by 19% in sterling terms. Another factor is real interest rates. When they are high, the opportunity cost of holding gold is also high. Conversely, very low interest rates mean that there seems little to lose by holding gold. Those two factors explain why the “Trump trade” was initially not very good for gold. In the immediate aftermath of the election, investors hoped that tax cuts would revive the American economy; this would force the Federal Reserve to push up interest rates and that rate boost would drive the dollar higher. Neither prospect would be good for gold. But the Trump trade has lost momentum. The president’s failure to repeal Obamacare has raised doubts about the prospect of a tax-reform programme being passed by Congress. Gold has duly perked up a bit since the start of the year, and the price rose by 1.6% on April 11th. But, although inflation may be a bit higher, nothing suggests a return to the kind of double-digit rates seen in the 1970s, when gold enjoyed a spectacular price rise. Even so, the metal has not performed as well as it might have done, given the geopolitical headlines. Perhaps this is because Mr Trump has backed away from some of his pre-election threats—on trade with China, for example. The bombing in Syria may turn out to be a one-off, and his statements on North Korea could be “full of sound and fury, signifying nothing”. With the help of advisers such as Rex Tillerson, the secretary of state, and James Mattis, the defence secretary, Mr Trump may turn out to be a more conventional foreign-policy president than expected. So buying bullion is really a bet that things will go spectacularly wrong: that events escalate in the Middle East and North Korea or that central banks lose control of monetary policy. It could happen, of course, but it helps explain why gold bugs tend to be folks with a rather gloomy attitude towards life.